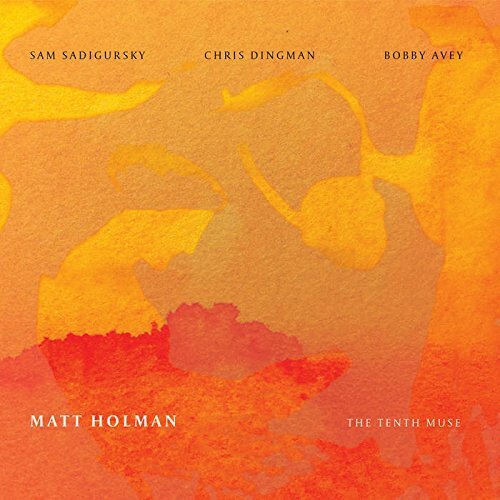 Matt Holman: trumpet, flugelhorn; Sam Sadigursky: soprano saxophone, clarinet, bass clarinet, alto flute, flute; Chris Dingman: vibraphone; Boody Avey: piano. Recorded December 14th and 15th at Oktaven Audio, Yonkers, NY. The 16 pieces on this CD are named after fragments of poetry written 2,500 years ago by the Greek poetess Sappho. The fragments are included in the booklet accompanying the recording, in Ancient Greek and in translation (by Anne Carson), and range from several lines to short phrases, e.g, ‘of all the stars most beautiful’ (track 1; fragment 104b). Holman was attracted to intricate beauty of these pieces and also by the fact that so little of the final pieces have been preserved. “What exists today is so minimal that the spaces between the words prompt the brain to fill in words and phrases,…” The idea that the poems have gaps and spaces resonates with Holman’s approach to composition, where he likes to create space for improvisational fills. In this, one might imagine a response to the poems as being as much an intellectual challenge as an emotional response. Indeed, Holman’s compositions are built on cryptograms for each fragment. These involve pitches and rhythms associated with specific letters or words. The resulting collection of pieces could, on this basis, have a dry and somewhat remote feel of a cryptic crossword puzzle. Fortunately, Holman plays flugelhorn and trumpet with a brightness and clarity which owes as much to classical as to jazz playing. This gives richness to each piece and strength to the presentation of each theme, as well as a vigorous improvisational development of the themes. Around these themes, vibraphone and piano provide a questing accompaniment, and multi-instrumentalist Sadigursky gracefully mirrors Holman’s playing. The whole collection has a feel of light reflecting off crystal, with glistening patches moving in and out of shadows and sudden sparkles that catch you off guard. While most of the pieces are played in ensemble, there are four short solos (one for each player), which are only a minute or so long but which provide opportunities to showcase some virtuoso playing. Overall, the mix of instruments, the compositions and the playing produces a music which superbly captures the fragmentary, fleeting beauty of the poetry.